i got the new house beautiful yesterday..
i mean, isn't it all a bit much? inlaid tile floors, fussy blue and white backsplash, tin ceilings, leaded glass all the way up, mega fussy cabinetry with spooling and quilting(?? 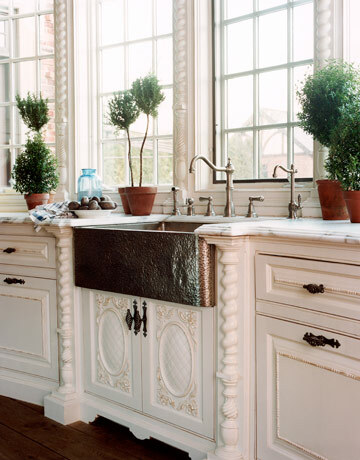 ), hammered metal sink and 5890852835784798 topiaries...ALL IN ONE ROOM?